They conjure up a world of plump girls urging their equally plump ponies over the jumps at their local gymkhana. But it now appears that life is increasingly imitating the much-loved cartoons of Norman Thelwell. Vets and animal welfare officials have warned they are increasingly concerned by the sight of riders who are simply too heavy for their steeds. Experts believe the problem is caused both by riders becoming too fat and choosing the wrong size horse to ride.British show jumping authorities have now launched a study to determine the maximum weight a rider should be in proportion to their horse. That would allow show officials to disqualify or exclude riders who are clearly too heavy for their animal. Such is the scale of the problem that judges at amateur jumps have already begun ordering riders to dismount after deeming them to be far too large for their horses. However, officials have been warned to exercise sensitivity when dealing with children who are overweight or too large for their ponies for fear of upsetting them. Animal welfare experts fear that horses could suffer long-lasting or even permanent damage carrying riders who are too large for them, including back problems, arthritis, lameness and muscle strain. The British Equestrian Foundation says that in many cases normal sized riders are climbing on to ponies that are proportionally too small for their size. But there have also been a number of cases in which overweight riders have arrived at events on horses clearly labouring under their bulk. 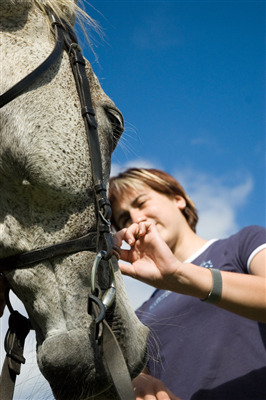 The study is to be conducted by the Animal Health Trust in an attempt to determine the safe and correct proportion of rider’s weight to the horse’s size. The problem reached farcical proportions when eight riders at the Great Yorkshire Show this summer were asked to climb down from their ponies over fears the animals were simply too small to carry them. Amid what observers described as “ludicrous” scenes, officials intervened after the eight adults were seen riding children’s ponies in the warm-up area of the show, held in Harrogate. The eight adults were said to have been exercising the ponies on behalf of their children before the start of a jumping competition, but vets feared they could cause the animals long-term damage to their backs and joints. One of the adults refused to dismount and continued to take part in the show, although he was later issued with an official warning for ignoring show regulations. One proposal is for show judges to simply deduct marks if the rider is too large, “so the judge does not need to directly engage with a child or adult” to avoid them being humiliated in public. The dilemma comes amid repeated warnings that Britons are becoming increasingly overweight. The latest available figures show that 26 per cent of men in the UK are obese, compared to 13.2 per cent in 1993, with 23.8 per cent of women classed as obese, up from 16.4 per cent compared to two decades ago. It has long been assumed in riding circles that a rider to horse weight ratio of 20 per cent is the maximum sustainable, but this has been based on simple custom and practice rather than any scientific assessment. Indeed, some experts believe that a rider should be no heavier than ten per cent of the horse’s weight. One recent study by the Journal of Veterinary Behaviour found that as many as a third of the 150 riders assessed at stables in Devon and Cornwall weighed more than 15 per cent of the weight of their horse.